Tate Modern’s retrospective of the work of one of Brazil’s most important modern artists, Mira Schendel, is a revelation. Highly-respected in Brazil but lesser-known elsewhere, Schendel’s artwork is deeply concerned with philosophical concepts of being and yet remains refreshingly light and approachable. 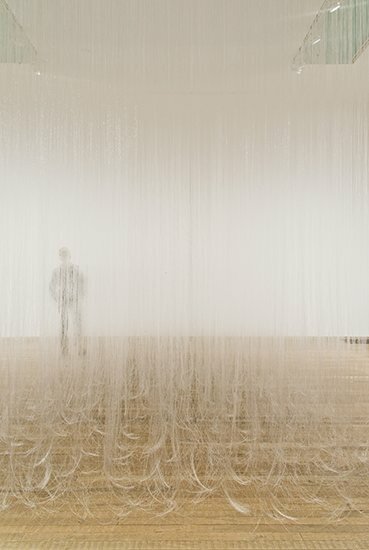 A show highlight is the installation Still Waves of Probability (1969), a collection of thin white nylon threads hung floor to ceiling, creating a translucent wall that is both beautiful and mystifying. Close up, it is possible to see each individual strand of nylon, but from afar the sensation is of gazing into a sort of seductive metaphysical void. The work seems deeper than its earthly dimensions, as if manipulating space to give the impression of the emptiness outside physical reality. For all that Schendel’s work deals with the essential meaningless of life, it is never depressing or cynical. Her many pieces that use letters and numbers as abstract forms, whether arranged in constellations of notes such as in Variants (1977) or in jumbled, transparent disks such as Untitled (Disks) (1972), seem almost jubilant, despite undertaking the serious job of demonstrating the arbitrary nature of language and signs. Schendel’s paintings deal with similar questions. 1963’s Untitled (Landscape) is a painting of two horizontal colour blocks suggesting a bleak horizon line, but the notion of figurative illusion is countered by the artist’s use of textured paint; the rough surface draws attention to the artwork’s status as a physical object. Later paintings, made when Schendel had access to more expensive tools, also reveal their own physicality, for example with the use of reflective gold leaf. Whether figurative or abstract, Schendel’s paintings seem to adhere to the Heidegerrian concept of art as requiring a solid presence in order to exist in any true sense. What is delightful about Schendel’s work is that it deals with serious subjects, particularly questions of being and language, without resorting to either pomposity or glib irony. The artist’s adoption of cheap paints and rice paper out of economic necessity during the early part of her career means that her work plays with ideas of physicality and transparency in unique ways; it has an immediacy and charm that makes this show a must-see for fans of modern art. The exhibition is open until 19 January.